Congratulations to our Abby Ledger who proved she is just as much of a champion off the water as she is on it. Abby became Whitstable Ladies' Pool Champion last week. The competition was held at the Savoy where she had a very convincing 4-1 win. Anyone who is interested in playing pool at the Club, please contact the office and we will put you in touch with the appropriate person. Well done to the WYC Pool Team who have maintained their position in the First Division this season. Now the league has finished Wednesday night is free for the Club Pool Ladder matches which are in their fifth week (78 matches played so far). The leader of the ladder at present is out Pool Team Captain, Chris Leamon. The ladder will continue to be played until 21 December and anyone interested should add their name to the list (on the notice board in the bar). A nail-biting finish to the first of the new quiz night series on Friday (7th November). Excellent evening, some very in-ter-esting questions and the start of a gourmet challenge on the 'bring your own nibbles' theme. Plenty of scope for more teams:- you have a month to polish the brain cells before the next round on 12th December. Losing team must set and present the next set of questions - well done, Andrew Folkard's team. We look forward to your challenge. Live band, champagne and lovely food - tickets will be available sometime next week from behind the bar. We are in need of a Class Captain for the cadets. We have a large number of cadets and, as a club, would like to find out what you need as a group - from social events to training issues. 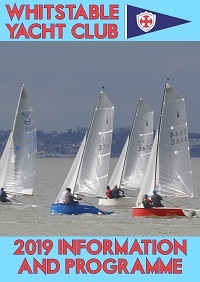 We need a person who is prepared to come to either the Sailing Committee meetings or, if school/homework does not permit, send an email which can be read out at this committee. 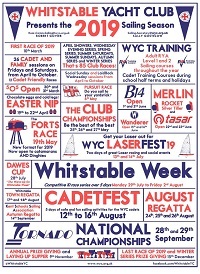 If you are interested, please add your name to the list on the Club Notice Board or, if this is not possible, email the office (office@wyc.org.uk). COME ON....this is your chance to get what you want from your Club! DEADLINE: 17 NOVEMBER. Whitstable boats took two of the top three places in a fleet of 20 Wanderers in the Inland Championships at Bewl Valley SC over the weekend. In very breezy conditions Gavin Barr successfully defended his title, crewed by Paul Cross. Chris Partington and Jack Skipper "sailed a blinder" to take 3rd place, beating several top Wanderer class sailors in the process. Well done Team WYC! I know of lot of you use the webcam but unfortunately we seem to have a connection problem with this at the moment. The whole system is under review and hopefully it will prove more reliable in the future. I have turned on and off nearly everything I can, have changed our wireless connection and jiggled around with wires but it still seems to be breaking down on a regular basis. I can only apologise and promise you a better system in the future. I will speak to our IT bods tomorrow. Melanie. We have two wines on SPECIAL PROMOTION at the moment. White Wine: Montana, Sauvignon Blanc 2007 (New Zealand) Red Wine: Wolf Bass, Cabernet Sauvignon 2006 (South Africa) Exceptionally good wine at regular prices. WHILE STOCKS LAST!! A truly successful weekend. Fifty entries, sunshine and good sailing breezes. Well done to the organising team… and here’s an extract from an e-mail just received from Don Findlay, our guest race officer:- “Thank you for making us so welcome. It is a joy to come to WYC each year. I cannot stress too strongly that the control of the RIBs and drivers by Ian is exemplary.” Congratulations to Rob Laws and Stuart France, first WYC boat at 6th overall.